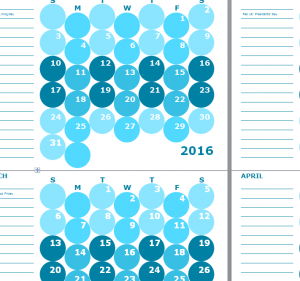 The 2016 Monthly Notepad Calendar is a great way to start organizing your monthly schedule. The template works by having a convenient area to write down any notes about a particular event or task within the month. Simply start in your current month and begin entering any relevant information that will help you plan and organize your schedule. This fun document allows you to write specifically detailed notes in addition to small reminders that you need to set for yourself. If you want to be more organized this year, there is no better time to start than now, download this free template to achieve all your planning goals! Start by downloading the free file, containing the document, to your computer. Click the link located at the bottom of the page to begin the downloading process. If you scroll down the page you can see that the months of the year are separated into smaller 4 small sections within a page. You can enter any relevant information for your schedule into the small bubbles that represent a day of the month. There is only enough room in the bubbles for a short one or two-word description. However, you can also go further into detail about your task or event in the left-hand column. The “Notepad” column of the document is a great way to write down all the important details of your schedule to fit everything nicely into the document. After you’ve successfully entered all your information into the document, you will be ready to print. Click the “File” button at the top of your screen and choose “print” from the following menu. With your new Notepad Calendar in hand, you’ll be ready to take on the rigors of the world!